Create a great old-fashioned vintage vibe at your next event with these glass hex jars filled with treats! Let your guests remember unhurried times, when a jar of candies or cookies was a real treat to be savoured for days! 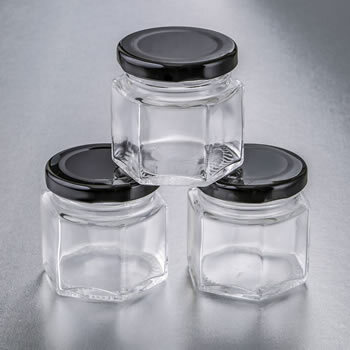 The 6 sided jars are made from glass and have a 2.5oz capacity. The jar has a black metal screw top for a tight seal. Hex jars come bulk packed in bubble bag egg crate box. Size 2" tall x 2.25" x 2.25"